Bakersfield, CA - March 09-11, 2007: The 49th edition of the March Meet was, in a word, incredible! John and Blake Bowser - with a lot of help from their staff - put on a drag race for the ages. From the full pits on Thursday to the Winners Circle shots on Sunday this was an event blessed with Chamber of Commerce weather, an accommodating facility, incredible racing surface, friendly staff, full bore fans and upbeat attitudes throughout. The 2007 March Meet was a grand slam home run by anybody's standards. The 35,000+ fans that packed the facility over the three-day event were treated to over 500 race cars, a packed manufactures midway, a wide variety of cacklecars, a swap meet, show cars, rat rods and many of the sports greatest stars. By Sunday everyone was already making their reservations for the 2008 event - the 50th Anniversary of the March Meet. One can only imagine what a blast that will be! Although there wasn't a Cacklefest per se, the cacklecar presence was palpable and drew huge crowds all weekend. There was push starts, burnouts, static starts and displays. Here is a sampling of the fun had by all and since this event was a "wing it" there is no rhyme or reason for the photos or their order. The cacklecars were spread out from the Top Fuel pits to The Grove. The cars were given ample space as the management wanted them to have the best exposure possible. Here is Dave West's Beebe & Mulligan beauty which was pitted just as you enter The Grove. Next door to West was Wayne King's "Doss-Clayton-King" restoration. Norm Weekly had his entire Frantic 4 display also in The Grove. As usual, Dennis Prater's Stellings & Hampshire beauty was in the Frantic 4 camp. NHRA museum resident, Safford-Gaide-Ratican was enjoying a weekend in the sun. 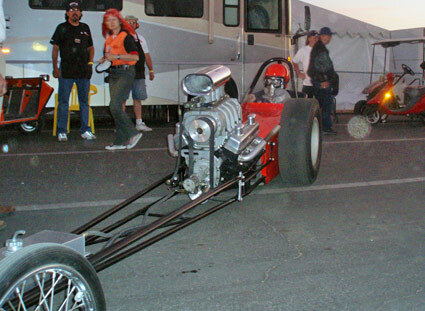 Peter Broadribb brought his popular honorary cacklecar "Moody's Garage" D/Gasser. Peter spent 5 years restoring this 1965 World Champion car to its original trim. The Ratican-Jackson-Stearns - A/A was also on loan from the Wally Parks NHRA museum. There were an abundance of static fire-ups over the weekend including several by Dusty McWilliams and the Howard Cams Rattler. In the car for this cackle was Gwen Drury who is obviously much smaller than the original driver, Larry Dixon Sr. Norm Weekly had several takers for his "Nitro Experience" in the Frantic 4 fueler. Model builder extraordinaire Roger "Riceman" Lee got his first seat in a nitro car and in a word - LOVED IT! The Anderson's were not shy about making noise with their "Vagabond". Positioned on a premiere corner of the Top Fuel pits and Midway was the Cacklefest.com pit that featured the Shubert & Herbert A/FD of Ron Johnson. The Speed Sport roadster was sharing the Big Yohns camp with the Shubert & Herbert fueler. Pit action aside, the most popular cacklecar exposure over the weekend was the push starts and in a couple of cases, burnouts. First out was Dusty McWilliams in the Howard Cams Rattler being pushed by Larry Anderson. 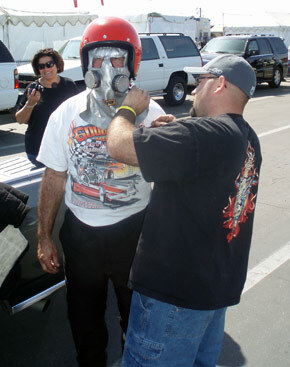 Dan Fenton is getting suited up prior to his Saturday afternoon "push-start" in Ron Johnson's Shubert & Herbert digger. His son, Richie, is doing the honors. Dan and Richie run a Junior Fueler which Dan now crew chiefs and Richie drives. Dan was pretty happy after the experience, his first time in a Nitro car and his first push start. Fenton and Team Big Yohns heads up track for the turn around push start. Take the same shot in black & white and it could be 1964. Ron Johnson (above) waits for the signal from Steve Gibbs (below). Johnson gets some solid whoops from the fuel Chevy and shuts it off ready for Sunday. Mike Boyd got the new Winged Express some track time Saturday afternoon. A real milestone for he and Mousie. Before the last Top Fuel qualifying session Dave West took the Beebe & Mulligan AA/FD to the topend for his push start. With the help of wife Charlie, West gets suited up. Dave had to sit in the car until Top Fuel qualifying was over. By the time he pushed down it was too dark to shoot anymore at the topend. After a successful push start West made the turn and lined up for a dramatic burnout that literally put the fans on their feet. While West was finishing up his spectacular burnout a group fire-up was arranged in the staging lanes. Since it was not announced most of the photographers missed it so the coverage is sparse. Here Wayne King works the throttle on his car. As it often is, it seems the Howard Cams Ratter was well covered for this deal. Fred Noftska, driver of the Evans Neumann/John Farr Junior Fueler sat in Shoobie Saturday Night. He remembered seeing it at Lions when he was a little kid and was thrilled with the experience. Ron Stearns had his nitro Olds barking at the crowd. Next to the Rattler was the Vagabond. Another crowd favorite was flawlessly restored Austin & McKendry twin engine AA/GD with original driver, Rich Rogers in the seat. Aside from several static starts in their pit, Austin and Rogers did this great push start and burnout on Sunday. The only thing that would make this the full meal deal would be if Rogers would wear a period correct mask and helmet. Sunday afternoon Ron Johnson put Top Fuel pilot Howard Haight in the seat of his Shubert & Herbert (aka Shoobie) for a push start and burnout. A little later on Sunday two pair pushed down and unfortunately the Vagabond had a problem firing and blew the top front of the #2 cylinder out. While the Anderson's surveyed the damage, Haight, who had gone out in round one of Nostalgia Top Fuel, wheeled the Shubert & Herbert car around them. Car owner, Ron Johnson makes sure the engine is happy before sending Howie on his way. No rookie, Haight, he eases into the throttle and starts the burnout. Trying something new, Big Yohns had taken the idler pulley off the engine and under good advice ran it ala Surfers. As can be seen here, the belt wasn't liking the idea. Just when the burnout was getting really good the belt exited, without any damage, the engine. After the show Johnson and Haight pushed back down in front of an appreciative crowd. Back to Camp Big Yohns - all is good.